Here’s what you should be doing, assuming that (1) you aren’t taking an LSAT prep course; and (2) you have no prior exposure to the LSAT. If you didn’t take the December LSAT because you didn’t feel ready, should you now take the February LSAT? 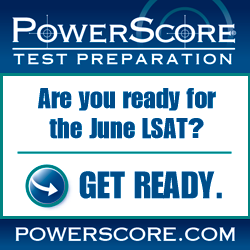 SPECIAL OFFER FROM OUR SPONSOR: Save $200 of PowerScore’s 1L Advantage Course! From now until the end of the year, PowerScore’s 1L Advantage course is only $295 (reg. $495). No promo code or coupon necessary! Should you submit your application now if you’re planning on re-taking the LSAT later? Should you tell schools you’re retaking the LSAT? Let’s take a look at a few of the past December LSAT scales and make some predictions for the Dec12 test. You need not resign yourself to enduring yet another harrowing family Thanksgiving. The LSAT is your secret weapon. Fewer students took the October LSAT than they have in over a decade, and law schools are making classes smaller. A break can work wonders for your LSAT score. Should older law school applicants forgo academic letters of recommendation? What happens when you’ve been out of school so long you can’t get an academic LOR?